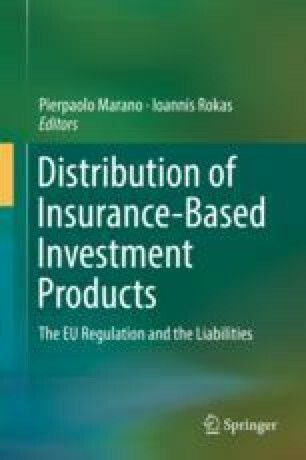 This article aims to provide an overview of the Italian legal framework in relation to the liability in the distribution of insurance-based investment products, offering an outline of the legal duties of insurance intermediaries and related liabilities looking both to the law in books and law in action. A paragraph therefore will be dedicated to an overview of the Italian case law. At the time of writing the legal framework is under review due to the implementation of EU Directives on insurance distribution. Nevertheless the main legal duties on insurance intermediaries do not seem will change significantly. Sections 1–2 are attributed to Diana Cerini. Sections 3–8 are attributed to Santa Nitti. Last updated June, 2017.